Chittenden County State's Attorney T.J. Donovan speaks Friday night at the Vermont Democratic Party's annual Curtis Awards dinner. 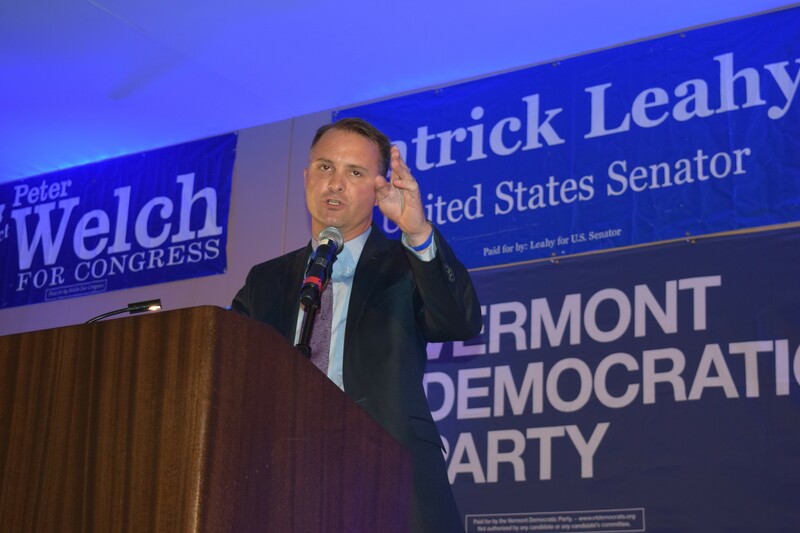 When he took the stage Friday night at the Vermont Democratic Party’s annual David W. Curtis Leadership Awards dinner, Chittenden County State's Attorney T.J. Donovan offered no indication of what office, if any, he might seek in 2016. By Sunday night, however, Donovan had made his decision: “I’ll be running for attorney general,” he told Seven Days. Donovan's decision was the first of many expected of Vermont office-seekers in the coming months as they react to Gov. Peter Shumlin's June 8 announcement that he won't seek reelection. The third-term county prosecutor had flirted with the idea of running for governor or Congress. But after spending Father's Day weekend at home with his family, the 41-year-old father of two young children said it had become clear that attorney general was a better fit for him. This won't be Donovan's first run for the post. In 2012, he lost to incumbent Attorney General Bill Sorrell by just 714 votes after a hard-fought primary. Donovan said that many at Friday night's dinner had urged him to make another run for AG. The South Burlington resident makes his decision without knowing whether Sorrell intends to run for reelection in 2016. The 68-year-old Sorrell, who’s served as attorney general since 1997, said Saturday he won’t make a decision until the conclusion of an independent investigation into allegations of campaign finance violations. “I look forward to the truth coming out,” Sorrell said. 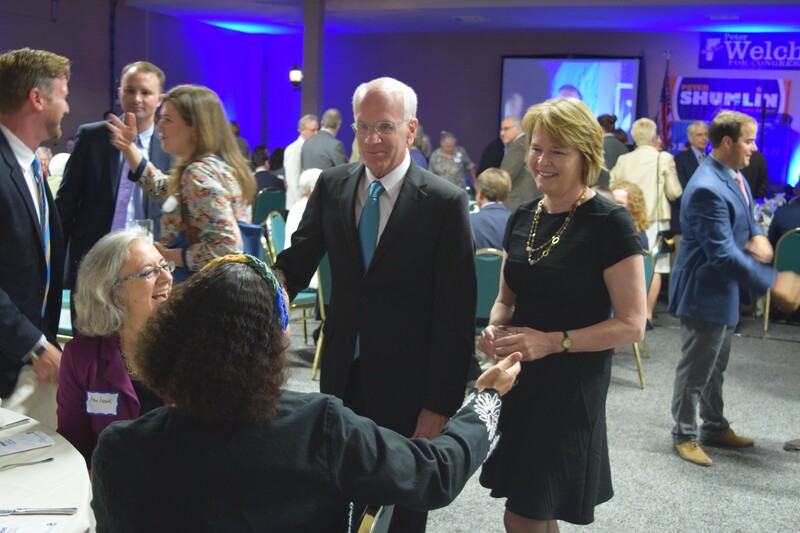 Congressman Peter Welch and his wife, Margaret Cheney, talk to Democrats at Friday night's party gathering. Many of the 350 Vermont Democrats who gathered Friday night for the Curtis awards dinner were hoping for clarity about who might be running for what offices in 2016. They came away with very few hints. From the stage Friday night, Shumlin joked about the fast-and-furious political speculation. “I think the only ones in this room who aren’t running for governor are me and [U.S. Senator] Pat Leahy,” he said. As they picked away at their buffet dinner, members of the Democratic faithful speculated about whether Welch, who’s held the state’s lone U.S. House seat since 2007, will run for governor or for reelection. If he chooses the former, what will that mean for a host of other ambitious Democrats who are deferring to Welch? The congressman himself and others who spoke from the stage steered clear of providing answers. “A lot of folks in this room are going to have to give a lot of thought about how they are going to serve,” Welch told the crowd. The Vermont Democratic Party did, however, conspicuously give two rising stars a heightened platform. Donovan and state Transportation Secretary Sue Minter won the annual Curtis Awards, as did Rutland County Democratic Party chair Kathy Hall. The awards are named after the late party activist David Curtis. Minter, who helped lead the state’s recovery efforts after the 2011 Tropical Storm Irene, has also been mentioned as a possible candidate for lieutenant governor, governor or Congress. House Speaker Shap Smith (D-Morristown), another possible candidate for higher office, was in the interesting position of introducing Minter, praising her work as a former state representative from Waterbury, Irene recovery officer, deputy secretary and now secretary of transportation. Smith said he and Minter have often talked about the challenges of juggling family and politics. State Transportation Secretary Sue Minter speaks Friday night at the Vermont Democratic Party dinner. In accepting the award, Minter launched into a campaign-style speech that carried enough of a national flavor to suggest she might be interested in a congressional seat. Instead of spending their time trying to repeal the Affordable Care Act, Minter said, Republicans in Washington should fix the nation's crumbling roads and bridges. Instead of holding hearings on Benghazi, she said, Republicans should do something about climate change. Afterward, Minter declined to offer specifics about her future. Minter acknowledged she’s been reminded recently that Vermont has elected just one female governor and has never sent a woman to Congress. “That’s something on my mind,” she said. Curtis’ son, Christopher, introduced Donovan by praising him for innovative criminal justice reforms, including a recent amnesty for those with suspended driver’s licenses. Donovan focused his speech on criminal justice. “We can continue with massive incarceration of drug addicts or acknowledge that criminal justice is the civil rights issue of our day,” he said. As Donovan soaked up stage time Friday night, Sorrell was notably absent. There was, quite literally, no sign of him. Banners for all the other Democratic statewide elected officeholders, except Sorrell, covered the wall behind the stage. Julia Barnes, executive director of the Vermont Democratic Party, said the party didn’t have a Sorrell banner to hang. 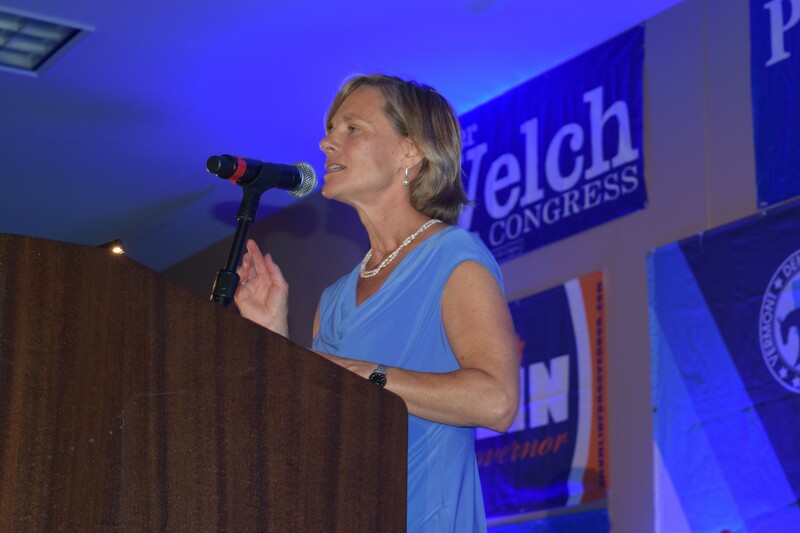 Welch was the last of the Vermont Democrats to take the stage Friday night. Handicapped by a cold, he gave the most tepid of all the speeches. With other possible gubernatorial candidates awaiting Welch’s decision, he was also the only one without an urgent need to make a strong showing. Welch said he would be traveling to Iraq next week. After the dinner, he declined to say whether he might make a decision about his plans before or after his trip.